Qatar’s Hamad Port will begin an expansion soon, after QR2 billion worth of contracts were recently awarded, the government said this week. The Ministry of Transport and Communications (MOTC) tweeted about the new contracts yesterday. It said they were for the second stage of works on the port. But they did not give further details about the companies who were awarded the deal or the timeline for development. Translation: Contracts awarded for QR2 billion for the first part of the second phase of #HamadPort. The announcement follows more than a week of sea blockades by the UAE, Saudi Arabia and Bahrain. The action has disrupted shipments into and out of Qatar, which previously trans-shipped at the UAE port of Jebel Ali. Shipping lines and Qatar authorities have responded by launching new routes via Sohar and Salalah in Oman. The MOTC also announced yesterday the start of what it called the Qatar-India Express Service. This will link Hamad Port with the Indian ports of Mundra and Nhava Sheva, which is near Mumbai and is India’s largest container port. The QR27 billion Hamad Port, which is south of Doha in Umm Al-Houl near Mesaieed, was always planned to be developed in phases. It started accepting commercial vessels in December 2015 and its first phase became fully operational a year later. It will be expanded in three stages, which will reach completion by 2020 – 10 years earlier than initially scheduled. By then, it will have three terminals with enough capacity to handle six million containers a year. This will triple the port’s current capacity of around 2 million containers a year. 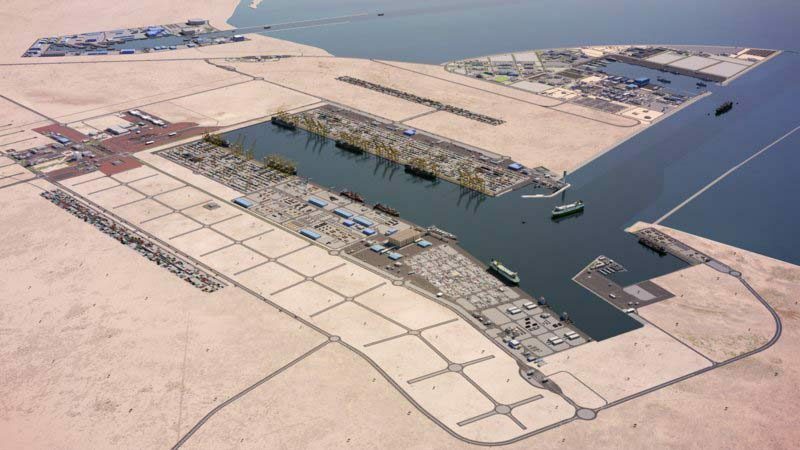 During the month of May, the Port handled nearly 46,000 containers, nearly 50,000 tons of general cargo and more than 100,000 heads of livestock, according to Qatar Ports Management Company Mwani. The recent Gulf dispute has disrupted the import of goods to Qatar by sea. Authorities have been trying to find new routes to the country, particularly for importing food. The MOTC yesterday announced a weekly service would begin between Qatar and the west Indian ports of Mundra and Nhava Sheva, which will expand trade routes with Asia. Two ships – the Hansa Magdeburg and the Hansa Duburg – will make the weekly trips, arriving at Hamad Port every Friday and departing the following day. The ministry did not say when this service would start. However, it could be as early as today. According to ship-tracking website Vessel Finder, the Duburg was yesterday located just off the coast of Doha, having left Nhava Sheva on June 11. The first shipment arriving in Qatar “will have 710 containers with readiness to receive larger shipments as needed,” the ministry said in the announcement on its website. Other ships have also been docking at Hamad Port in recent days, bringing in food, livestock and other cargo. The Sao Paulo, carrying a Liberian flag, arrived in port on Wednesday, port operator Mwani said. This is in addition to the launch of a new route between Qatar and Sohar and Salalah in Oman. Danish shipping company Maersk Line announced on June 10 that it would lay on feeder ships to connect Qatar with Oman, where goods would be transshipped (transferred from one ship to another) to locations outside the Gulf. The first ship will leave Salalah on June 19, and is due to arrive in Qatar a week later, on June 26, it said. Note: this article was edited to correctly reflect the value of the contracts was QR2 billion, not $2 billion as previously reported.